July 24, 2018 /37 Comments/in Featured Articles, Free Speech /by Andrew Joyce, Ph.D.
Back in March, the sixth biennial meeting of the Global Forum for Combating Anti-Semitism convened in Israel. Run by the Israeli government, hosted by Benjamin Netanyahu, addressed by former French Prime Minister Manuel Valls, and staffed by a large cast of Jewish academics from around the world, the Global Forum makes a priority of “fighting cyber hate.” A modern day “Grand Sanhedrin,” the number of representatives from various Jewish organizations totaled just over one thousand, including leaders from the Anti-Defamation League; Simon Wiesenthal Center; American Jewish Committee; Conference of Presidents of Major American Jewish Organizations; Conseil Représentatif des Institutions Juives de France; the International Holocaust Remembrance Alliance; B’nai B’rith; World Jewish Congress; and the Institute for the Study of Global Anti-Semitism and Policy. The Global Forum is essentially a central think tank for the campaign to introduce internet censorship throughout the West. It is also an internationally operational anti-White hate group that devises intellectual and political strategies styled as “recommendations” for Western governments to restrict the freedoms of their respective populations. 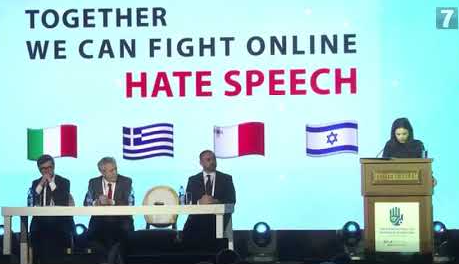 The ‘recommendations’ of the Forum include a demand to adopt “a clear industry standard for defining hate speech and anti-Semitism.” This, of course, would be a definition of ‘hate speech’ and ‘anti-Semitism’ that would serve Jewish interests most effectively. It goes without saying that such a definition would be sufficiently wide-ranging that it would preclude, under threat of severe punishment, any criticism of Jews or Israel. direct education ministries to increase teacher training and adopt pedagogic curricula against anti-Semitism, and towards religious tolerance and Holocaust remembrance. Further recommendations to governments include the establishment of national legal units responsible for combating ‘cyber hate’; making stronger use of existing laws to prosecute ‘cyber hate’ and ‘online anti-Semitism,’ and enhancing the legal basis for prosecution where such laws are absent. This is a group overwhelmingly preoccupied with the silencing of Whites, the end of freedom of speech in the West, and legal enforcement of multiculturalism. An interesting aspect of these discussion topics, in addition to the minimal attention to Islamic attitudes, is the growing Jewish unease with the Left. I recently remarked that it is entirely possible for the Left to become a cold house for Jews without becoming authentically, systematically, or traditionally anti-Semitic. I added that one might therefore expect Jews to regroup away from the radical left, occupying a political space best described as staunchly centrist — a centrism that leans left only to pursue multiculturalism and other destructive ‘egalitarian’ social policies, and leans ‘right’ only in order to obtain foreign policy assurances as well as elite protections and privileges [domestically for the Jewish community, internationally for Israel]. It goes without saying that those gathered in Jerusalem were wholly in support of multiculturalism and the LGBT agenda in the West, but also wanted the “privilege and protection” of increasingly authoritarian control over the speech of the Western masses. In keeping with my argument that Jews will increasingly posture themselves as the ultimate centrists or liberals, many if not all of the Jewish intellectuals involved in the campaign to end free speech do so while shamelessly and hypocritically posing as the truest defenders of freedom and liberty. A classic example in this regard is Raphael Cohen-Almagor, a key figure in the Global Forum and perhaps the leading anti-free speech intellectual active today. In one 2015 speech at the Global Forum, Cohen-Almagor, who poses as a defender of liberty, called for increased interactive efforts between governments, law officers, and anti-terrorism units, alongside companies and NGOs. He wants Big Brother watching you. Cohen-Almagor received his D. Phil. in political theory from Oxford University in 1991, and his B.A. and M.A. from Tel Aviv University. In 1992–1995 he lectured at the Hebrew University Law Faculty. He appears to have always had a keen interest in the use of communications — from 1995–2007 he taught at the University of Haifa Law School, Department of Communication, and Library and Information Studies University of Haifa. He is a very strongly-identified Jew, having acted as Chairperson of “The Second Generation to the Holocaust and Heroism Remembrance” Organization in Israel. He also shamelessly but aggressively postures himself as a ‘defender of democracy,’ acting as Founder and Director of Center for Democratic Studies at the University of Haifa. He is currently Chair in Politics at the University of Hull, United Kingdom. Cohen-Almagor’s most recent significant production, titled “Taking North American White Supremacist Groups Seriously: The Scope and the Challenge of Hate Speech on the Internet,” appeared last month in the International Journal of Crime, Justice, and Social Democracy. Along with an earlier piece from 2016, the article is an excellent sample and summary of Cohen-Almagor’s work to date, and also acts as a remarkable and important example of Jewish manipulation of discussions of free speech and the politics of White advocacy. It deserves to be excised from the broader tumorous mass of similar activity and placed under the microscope. [C. Edwin] Baker (1992, 1997), for instance, argues that almost all of the harm inflicted by free speech is eventually mediated by the mental processes of the audience. The audience decides its reaction to speech. The listeners determine their own response. Any consequences of the listeners’ response to hate speech must be attributed, in the end, to the listeners. The result is the right of speakers to present their views even if assimilation by the listeners leads to or constitutes serious harm. Baker (1997, 2012), like many American liberal philosophers and First Amendment scholars, wishes to protect freedom of expression notwithstanding the harm that the speech might inflict on the audience. … Consequently, many of my interviewees argue that American liberals thus tend to underestimate the harm in hate speech. It is surely a damning indictment of the state of modern peer-reviewed academic journals that someone could publish an argument against the principle of free speech solely on the basis of the putative content of obscure and minuscule internet sources which are no longer even in existence. Criticism thus becomes conflated with hate. It goes without saying that there is a crucial difference between the two definitions, and it is in the gulf between these two definitions that these activists seek to assassinate our freedom of speech. Mere criticism may not “injure, dehumanize, harass, intimidate, debase, degrade, and victimize” anyone, but the existence of a legislative framework privileging minority interpretations of such criticism will surely consign it to hate speech categorization. Perhaps this is quite terrifying to Jews, but as a philosophical argument for the annihilation of free speech it is catastrophically lacking. Cohen-Almagor provides no evidence suggesting a link between even the most incendiary racial commentary on the internet and acts of violence. The only two examples he attempts to provide are almost two decades old, and concern individuals with clearly unsound mental health — spree-shooter Benjamin Nathaniel Smith having exhibited all the signs of conduct disorder and psychopathy in adolescence prior to his 1999 rampage, and Buford O. Furrow having been hospitalized a number of times due to psychiatric instability and suicidal tendencies prior to his shooting spree at a Jewish community center, also in 1999. Even the most basic critique of such a proposed link would ask why, given the proliferation of the internet and social media between 1999 and 2018, there has been a decrease in violence from the far right. Indeed, if one can excuse the continued use of the “racist” and “hate” buzzwords, it’s difficult to disagree with one University of California, Berkeley study that pointed out: “Although White racist groups have proliferated on the Internet in recent years, there appears to have been no corresponding increase in membership in these groups or in hate crime rates. In fact, one might argue that the prevalence of racist groups on the Internet works to reduce hate crime, perhaps by providing less physical, more rhetorical outlets for hate.” The entire foundation of Cohen-Almagor’s argument — that there is a link between internet activity and White racialist violence — is a total fabrication. Overly permissive and tolerant attitudes towards hate speech is a form of akrasia, whereby people act against their better judgment. Not just those who post but also those who allow such postings on their servers are culpable for their akratic conduct. Whether through ignorance, indifference or insistence on clinging to freedom of speech without caring about dangerous consequences, these are unjustifiable. Internet service providers are expected to abide by a basic code of conduct, one that objects to rather than celebrates violence and its promotion. When it comes to hate speech on the Internet, society and its regulators cannot continue to remain akratic and avoid responsibility for the harm that is inflicted. Given the pervasive, expansive and transnational nature of the internet and the viral nature of hate materials, counter-speech alone is not a sufficient response to cyber hate. The right to free expression does not require or obligate the internet industry to disseminate hate materials. They too are moral actors, free to pursue internet commerce in line with ethics, social responsibility, and a mutually agreed code of conduct. It would be difficult to overstate how dangerous the activities of Cohen-Almagor and the wider Global Forum are to our freedom. These groups have developed a system of relatively sophisticated and manipulative legal and philosophical arguments based on blatant fabrications. The “recommendations” resulting from the deliberations of the Global Forum will receive disproportionate attention and influence in government due to top-level networking and co-operation with hostile elements of native elites. What we are seeing, hiding in plain sight, is the devising of a series of ‘protocols’ that will disenfranchise and gag us into submission. Internet freedom really is a last stand, and we will have to produce and disseminate appropriate counter-narratives before it’s too late. We could start by questioning the morality of a situation wherein restrictions on European freedoms are being dictated from Jerusalem. R. Cohen-Almagor, ‘Taking North American White Supremacist Groups Seriously: The Scope and the Challenge of Hate Speech on the Internet,’ International Journal of Crime, Justice, and Social Democracy, Vol. 7, No. 2 (2018), pp.38-57. R. Cohen-Almagor, ‘Hate and Racist Speech in the United States: A critique,’ Philosophy and Public Issues, Vol. 6, No.1, pp.77-123.